@Kerri - thanks for stopping by Kerri. 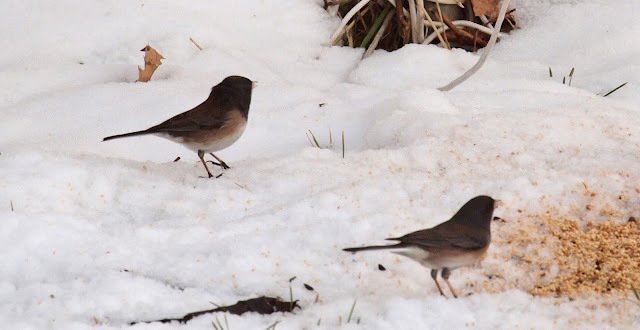 I'm secretly hoping that one day the different Juncos will be split into different species. I track them in eBird separately too...just in case. 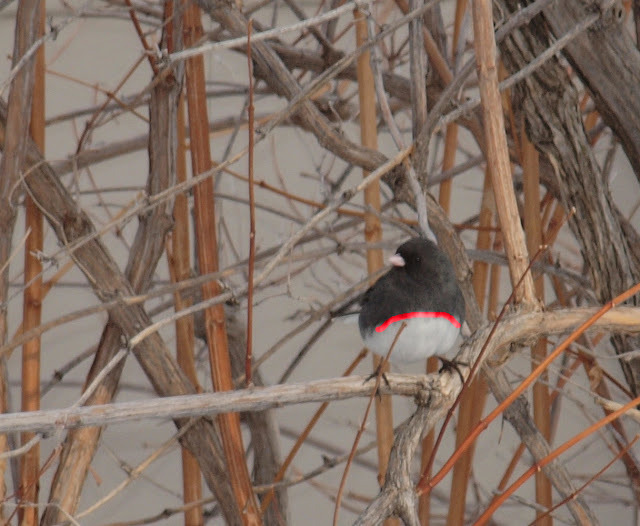 What's that red band across the junco's chest? 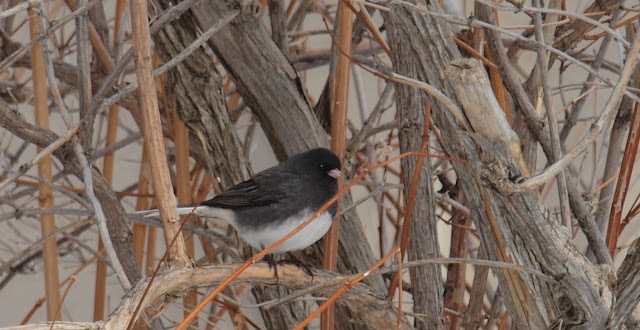 I just became aware of the different groups of dark-eyed juncos. 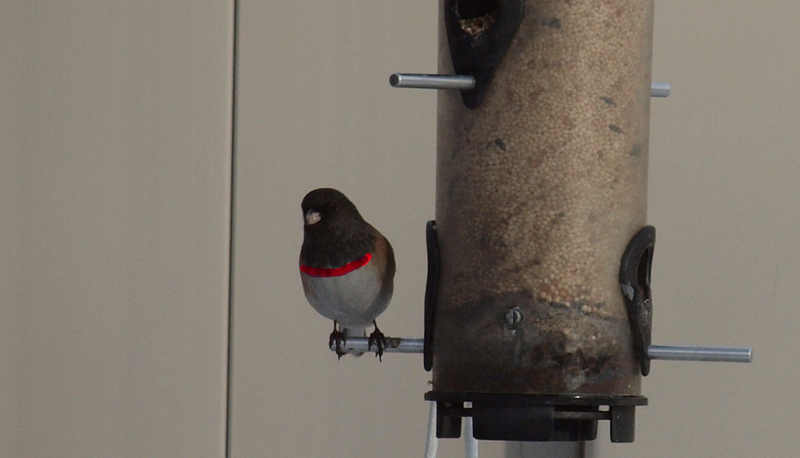 I took a photo of one at my feeder and identified it as a dark-eyed adult brown female! From the distance they had all looked the same to me, i.e.black and white birds that appear at the feeder in the winter. But now that you mention it they certainly look like different species. @hilke I added the red bands on the chests to emphasize the concave vs. convex bibs on the two different subspecies of Junco. Which subspecies are you getting at your place? Aha! I am so dense! We are getting the slate-colored junco. The other day I photographed a female brown slate-colored junco - the first one I have ever actually identified. I put a photo on my Facebook page - but I guess you are not on Facebook? - It's a convenient way of exchanging information quickly. 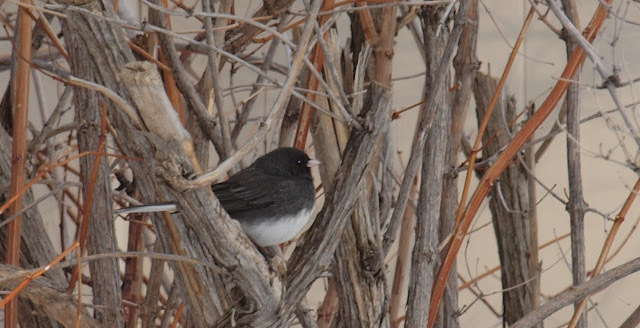 Nice info on the juncos there. I used to see several varieties when I went to Madera canyon. Then I would have to pull out my bird guide to remember and distiguish them all: pink-sided, oregon, red-backed, gray-headed, and yellow-eyed. The only variety I have not seen is the white-winged. We do get the slate-colored here all the time. I have at least 6-10 on a regular basis. Some of them are brownish. I have never noticed or heard of the convex/concave detail you have pointed out. Nice tip!